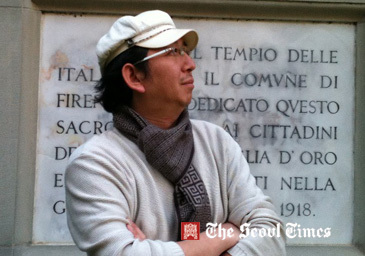 The Seoul Times has recently interviewed Lee Kwang-Beom, vice director of the Italian Culinary Institute for Foreigners (ICIF) in Seoul's Jamwon-dong and listened to him on why ICIF is the best cooking school for Italian food and on how it produced the best Italian chefs. The following is the full text of the interview. 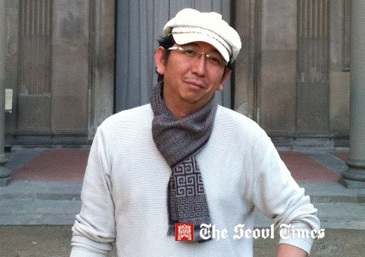 Q1: First, The Seoul Times would like to thank you for this interview opportunity. Would you please tell us briefly about the Italian Culinary Institute for Foreigners (ICIF) and your role as its vice director? When did you start working for ICIF? A1: Set up in Torino, Italy’s Piemonte Region in 1997, ICIF is regarded as one of the world’s three major institutes of culinary education. It is the world’s one of the best cooking schools for Italian dish. It was established by Piemonte government coupled with top of the line cooks and runners of the Italian restaurants. A number of students from 32 nations in the world visit the main office of ICIF in Italy for cooking education programs which are designed for purely foreign students. 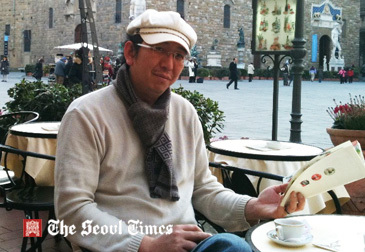 “ICIF Korea” was established in Seoul in 1999 after a group of South Korean chefs visited ICIF in Italy. Among ICIF’s 32 branches around the world only ICIF Korea is running the program of “Master Preschool,” which is very effective and high quality program. For me I have been working here at ICIF Korea since 2005. Q2: What are the courses and the programs offered by your institute? In particular, explain to us about the "master course." How long does it take for the students to finish it? Do your students have the opportunity to take the culinary education in Italy also after graduation here? A2: There are three programs: Master’s Course, short-term training in Italy, and short-term training in Korea. Master’s Course is quite professional program to those who wish to become Italian cooking professionals. Our students undergo three moths of domestic program which includes the practice of the Italian language and the basic cooking skills. After this, they go to Italy for two-month training at ICIF headquarters. And then they will have about four months of actual cooking practice at top quality restaurants in Italy. Our new chefs are born through the nine months of this intensive training. Now new batch of students are waiting for departure for Italy, after completing successfully the required procedure. I would like to emphasize the importance of the local Italian experience for our students. And this hands-on practice will boost the grade of the cooking skills of our students. They learn the authentic Italian cooking in Italy. Up until now we have produced well over 300 graduates from ICIF Master’s Program. Most of our graduates are now actively working at Italian restaurants in South Korea and they are making ICIF very famous. Plus, many of our graduates are employed as chefs at the restaurants in Italy. 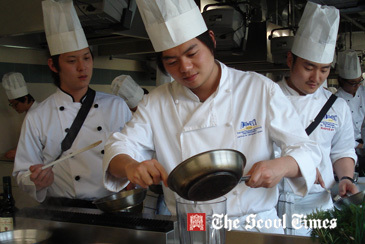 Q3: What are the advantages of your programs or the ICIF compared with other Italian culinary schools in South Korea? A3: I guess that we have competitive edge in three areas. First, we have a good history and tradition. ICIF Korea has been in operation for the last 11 years. We have accumulated lots of educational know-how and built up a strong network of our graduates. We consult our graduates with the right and useful information. Second, our program is directed solely at foreigners. This means that our students have less or no linguistic problem dues to our complete system of translation and language assistance. Third is our intensive and efficient learning program. For other cooking programs at other schools it takes two to three years. Due to the relatively long period students tend to lose their concentration in the course. But ours is a nine-month intensive and highly specialized Italian cooking course, which is quite efficient. Q4: What are the requirements or qualifications to be admitted to your institute? How helpful are your courses and programs to your students for their future career? A4: There is no special requirement. As long the individual has a strong desire for learning Italian cooking any body can enroll in our program. But, they have to be 18 or older to be admitted and they should be the holder of valid passport. In our nation’s universities and colleges offer only general and too broad programs at their food-related departments. So graduates think they need to go to such specific countries as Italy, France, China, and Japan, depending upon their specialized program. Unlike theirs, our programs are very practical and effective. The 250 of our graduates are proving this. They all work actively at the top Italian restaurants in the nation. Also many of the places want to hire our graduates. Q5: I am wondering if the courses ICIF provides are the pure or classic Italian cuisines the ordinary Italian people enjoy. Or, are they localized Italian food tailored to suit the taste of local Korean people? A5: The authentic Italian dishes might be a little too salty to the taste of Korean people. And some pasta or gnocchi could taste a bit hard (uncooked) to the local Koreans. But we still stick to the authentic taste and style. Only after they learn authentic way, they can develop their own style. 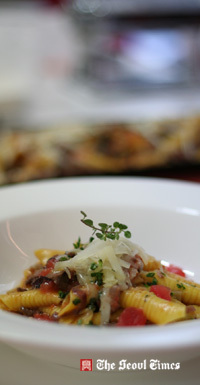 Presently, many schools and academies tend to teach fusion style of Italian cooking to the students. I do not agree with this way. This way they will face the big limit in trying to develop their own style. I believe that fusion style can be developed only on the bases of mastering the tradition and authentic style. So, we cling to the authentic way first. Q6: Some people say that the most popular Italian food — pasta, pizza, meat, and desserts — are easy to make. I suppose that this could be at least one of the reasons for its popularity. What makes Italian cuisines so popular around the world? A6: You are right. Italian dishes are relatively easy to cook and to eat. It is one of the main advantages of Italian food over others. But also Italian food is one of the most difficult food to make. Italian foods are made to keep the original taste of the food material, and this is the focus. In case of French or Chinese food they add lots of spices or ingredients, making it difficult to maintain the original taste of the food material. However, Italian dishes are cooked to keep the original and natural taste of the material as much as possible with the limited use of spices and through the authentic cooking process. Above all what makes Italian dishes popular around the world is that dieters can enjoy them easily and deliciously. Q7:What are your plans to further develop the courses and programs of your institute? Do you plan to recruit more students? What are your development plans? A7: We have no plan to increase the number of our students drastically. And I always think that quality is more important than quantity in our school. We always put our primary stress on the quality of our programs. Yet, we are studying on the diversification of our programs. In the year 2010 a program of sommelier was established at ICIF headquarters. And I expect that there will soon be an opening of the same sommelier course here in Seoul as well. It will be officially announced on our website (http://www.icif.co.kr). Q8: Tell us about your first experience with Italian food and this institute. What were the occasions of your being involved in this business? It looks similar to madu (dumpling) of Korea. I still do no forget the moment I tasted ravioli there. It was made by the female owner of “San Marcos” and there were many others to get the taste of ravioli there back then. It was a small restaurant run by a country couple in their 60s. But the humble and simple taste of ravioli there was just so great that I still do not forget the taste of it. Not long after I rounded up my European tour soon I came to be involved in ICIF Korea. I hope that my students will be able to grow as a chef who can produce the same taste I had long time ago in Italy. Q9: Would you introduce your hobbies? Do you enjoy any sports activities? A9: I do not seem to favor only certain hobbies. But with time permitting I try to enjoy as many as possible hobbies. Reading, watching movies, listening to music are my habitual hobbies. Strangely enough here in Korea sports are divided between soccer and baseball. In my case I like them both but to tell the truth, I like baseball slightly more than soccer. I visit base ball parks about a dozen times per year. Plus, I like all kinds of sports. I am fan of sports. Q10: Could you introduce your family? What do your family members do for a living? A10: All of my family members have all professions of their own in their respective field. But I’d rather not go any further details. Like my senile father, all of our three brothers love looking. In particular, my second older brother is as good as any professional chef, due perhaps to the influence of my father who loves to cook.